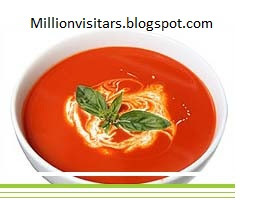 Welcome To Millionvisitars, Tomato Soup Is Very Tasty, In a Rainy Days Even In Winter You Really Like This Hot Soup Let’s See How To Make Tomato Soup. First, wash tomato and ginger with water and grind than in the grinder. Take a pot and boil tomato paste for 8-10 minutes. Filter that paste with a sieve. Mix corn flour in a two tablespoon water, break all the bubbles and increase the water level up to 1 cup. In a kadhai heat the butter, and add peas and carrot and fry them for 3-4 minutes. When they get soften add corn flour mixture, tomato paste, salt as required, black pepper powder. Add some water if want, boil it for 6-7 minutes. The Tasty Hot Tomato Soup Is Ready to Serve For 3-4 Peoples, And It Just Takes About 25-30 Minutes.